Make your old PC live longer — and your new PC run faster — with AVG TuneUp. Our PC optimizer comes with revamped Sleep Mode technology to boost your PC speed and performance, and Disk and Browser Cleaners that free your storage space. Want more? Read on. Tired of bugs, crashes, and freezes? AVG’s improved Automatic Maintenance tunes your PC every week for you, so you can simply enjoy better performance, 24/7. If you want your Windows operating system to work as it should and avoid errors and crashes, let AVG TuneUp identify issues in your registry and fix them automatically. Our automatic maintenance cleans up browser traces, tracking cookies, cache files and program leftovers for more disk space. Installed programs slow you down by hogging your PC memory and CPU. Our completely revamped Sleep Mode technology puts them to sleep and wakes them up when you need them — and not a moment sooner. Sleep Mode identifies apps with lots of startup items, processes running in the background, scheduled tasks....and puts them to sleep, so they don’t drain your PC and slow you down. Kick-start sleeping apps at your convenience — our patented technology automatically enables all background activity. After you’re done using the app, we’ll re-freeze all draining background activity for you. Old unnecessary programs, toolbars and trial versions, software that came preinstalled in your PC… they take up space and can cause trouble down the road. 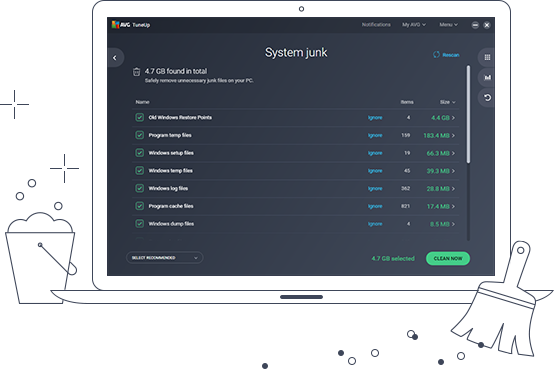 Our Software Uninstaller detects bloatware and helps you get rid of it, together with programs you no longer use — and forgot you had. 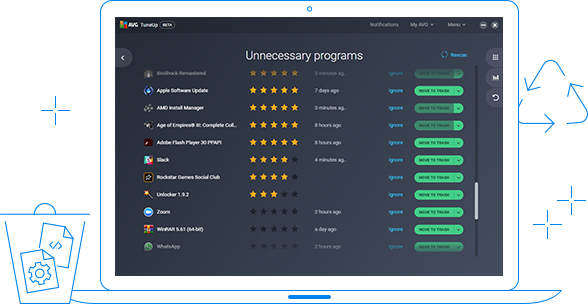 Get a full list of programs installed in your computer — including pre-installed apps you never asked for — and see how they score in usefulness with our cloud-based rating system, combining blacklists/whitelists, heuristic algorithms, AVGs Recommendation Engine, and user ratings. 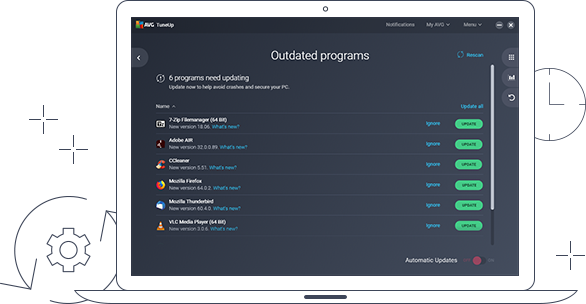 See which programs you haven’t used in a while, and identify the ones you don’t need anymore. Not sure about a particular app? Use the Move to Trash feature to put it in quarantine. From installer files to the cache. From old backups to temporary system files. They’ve fulfilled their purpose, but now they’re just dead weight — so we clean them up and make space for the stuff that really matters. Temporary data and online leftovers? Gone. We remove the files that Internet Explorer, Chrome, Firefox, etc can’t get rid of by themselves. The result? A lighter, faster, less buggy browser. Prevent security issues, bugs & irritating installers: AVG TuneUp’s Software Updater checks your installed software, such as Java, VLC and Skype, and easily updates them all to the latest, greatest versions. Wine gets better with age. Software doesn’t. Our Software Updater works fully automatically and supports updates for more than 50 of the most popular apps - with more added regularly! The 2019 AVG TuneUp release has exceeded expectations! Here’s our official numbers (full whitepaper coming soon). For Windows: Chinese (traditional), Chinese (simplified), Czech, Danish, Dutch, English, French, German, Indonesian, Italian, Japanese, Korean, Malay, Norwegian, Polish, Portuguese (Brazil), Portuguese (Portugal), Russian, Slovenian, Spanish, Swedish, and Turkish.